Hanging washing on the line may not be the most life-dependant use of MetService forecasts when compared to farming, electricity generation or adventuring into the mountains. However, significantly more of us do it, and the environmental, economic and health benefits add up. Clothes line and weather forecast users have every right to be proud of their skill and bravery in drying clothes outside in New Zealand’s changeable weather. 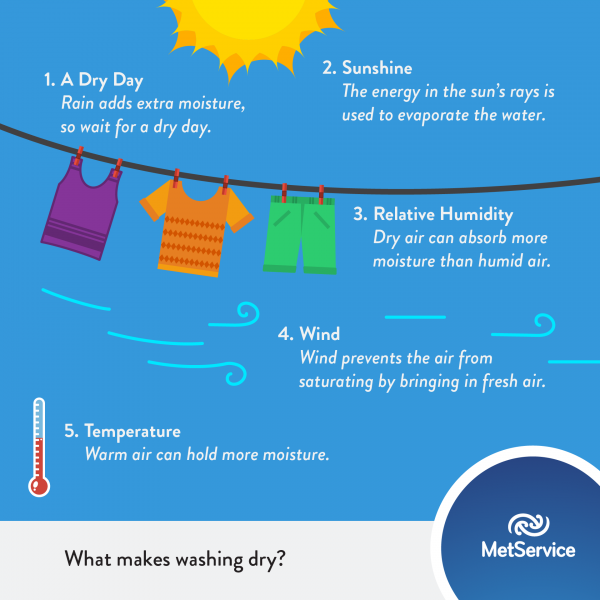 A June 2017 Canstar Blue survey showed that 75% of New Zealanders have a clothes line, yet 20% of those admit to using a drier even when it was sunny outside. The benefits of hanging washing outdoors are well known, so the reason for this is presumably uncertainty in the weather. In this blog post we explain the science of drying clothes, and how to feel confident in your free and natural laundry service. What are the benefits of outside drying? According to energywise.co.nz the average drier load costs $1 , compared to free outside drying. A BRANZ study found that the average Aucklander creates 0.35 loads of washing per day, so the potential annual saving is nearly $130. All of the water contained in your washing has to go somewhere. Unless the dryer vents to the outside, that moisture ends up in your house, leading to humidity and mould. Sources vary on the average amount of water in an average dryer load, but a Glasgow University study found that most loads released between 2 to 2.5 litres of moisture . Over a year that is equivalent to pouring three buckets of water into the walls and ceiling of your house. Drying clothes outside keeps all that moisture out. There are also health benefits to outside drying. The ultraviolet in the solar radiation kills bacteria and dust mites, as well as bleaching stains . Clothes also last longer: all the lint inside the dryer? That is mainly made up of bits of your clothes. It is obvious (and fortunate!) that the temperature doesn’t need to reach the boiling point of water to dry clothes, so how does the water evaporate? Even on a cold, dry, low humidity night, with a bit of wind the clothes will still contain less water molecules (or ice if below zero degrees) in the morning. This is because molecular bonds hold water molecules together in the form of liquid or ice, and surface forces hold the liquid water or ice on to the fabric of the clothes. Some clothing, such as waterproofs, has had a special hydrophobic treatment to reduce these surface forces, which enables them to repel liquid water better. If a water molecule has enough energy it can break the molecular bonds, and become a gas molecule. A free gas molecule is not subject to the same surface forces and is much more able to escape the clothing. The key is that not all molecules in a gas, liquid or solid have the same energy. They have an energy distribution described by the Maxwell–Boltzmann distribution, which is graphed below. The coloured lines show the distribution of energies for four different temperatures. At colder temperatures the average energy is lower, but there are still a few molecules with enough energy to break the molecular bonds and evaporate. As the temperature decreases, there are fewer of these high energy molecules, so it will take longer for clothes to dry, but they will get there eventually. This means that in dry air, water and even ice can still slowly evaporate (or sublime if it is ice), even if the temperature is below freezing. Owners of ‘frost-free’ freezers, which pump air around to remove its moisture, will notice that ice cubes will slowly shrink, despite the temperature being below zero. This is due to the same effect, with the ice molecules gradually breaking free. Ice cubes do not shrink in a regular freezer, as the air is nearly always saturated, which leads us to the next point. While water molecules are escaping the clothing and into the air, water molecules from the air are also condensing into the fabric. Depending on the temperature and pressure of the surrounding air, there is a point called saturation when the air cannot hold any more molecules. At saturation, equal numbers of molecules will leave the clothes as will arrive, and the clothing will not dry. In meteorology we refer to saturation as 100% relative humidity, which itself is a percentage expressing how close to saturation the air is. For example, if you leave a can of petrol open it will slowly evaporate, even though the boiling point of petrol is above 100C (the exact boiling point depends on the grade of petrol). However, with a lid on, the air inside the can quickly saturates (with petrol) and the liquid petrol doesn’t disappear. Finally, the energy in the water molecules doesn’t all come from thermal energy in the surrounding air. You will notice on a hot day with clear skies, that dark objects – such as a thermometer in the sun, or a dark coloured car or clothing – will heat to higher temperatures than the maximum temperature in the weather forecast. This is because the forecast is for the air temperature, not for dark objects for which the temperature is dependent on their colour, location, shape etc. These objects are absorbing radiative energy direct from the sun, in addition to thermal energy from the air, so end up much hotter. This is also why all good weather stations keep the thermometers in the shade. This means that even on a cold, sub-zero morning clothes that have been frozen rigid overnight can still dry quite quickly if they have good sunlight. When should you hang out the washing? Rain is clearly the most important factor here. Check the forecast for choosing a dry day to hang out your clothes. A small amount of precipitation may be okay if given long enough to dry, but generally rainfall rates are measured in whole millimetres per hour, whereas evaporation rates are typically around a tenth of that. Solar radiation, (also known as irradiance or just sunshine), is the next most important factor. It takes energy to evaporate water, and the best source is direct solar radiation. Some energy will come from the long-wave radiation emitted from the ground, especially if the ground has been already warmed by the sun. Other energy is also conducted across from the ambient air temperature. However, the most significant source of energy is radiative energy direct from the sun. Thirdly, humidity is important. The moisture in your clothes has to evaporate into the air, requiring it to be less than 100% relative humidity (saturated). The lower the relative humidity, the faster clothes will dry. Relative humidity is simply the amount of water vapour in the air, relative to how much vapour the air holds at saturation. Wind is also very useful. On a still day, the air around your clothes can saturate, slowing down or even stopping evaporation. On a windy day, the humid air is transported away, and fresh air below saturation brought in. Temperature is important, but not as important as humidity. A warmer day enables the air to hold more moisture, but if it is already saturated it won’t help. 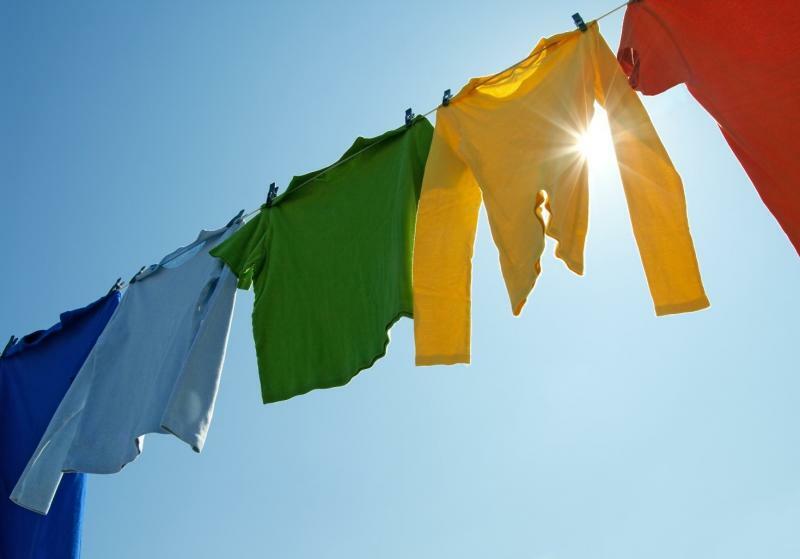 A cold, dry day will dry clothes faster than a warm humid day, especially if the clothes are in direct sunlight. Many equations have been formulated that combine these factors together to determine evapotranspiration (the amount of water evaporated) from the ground, and is an essential part of soil moisture planning in agriculture. The Penman-Monteith is regarded as the current best model. MetService MetConnect users can find this value given as a ‘drying index’ for towns and cities. This equation has also been applied to washing, for example in this study from Leicester University in the UK . Using this approach, we can estimate drying times for clothes in New Zealand, with some basic assumptions on the surface area and water content of the clothes. The maps below use the Penman-Monteith equation. On the day shown, the North Island was sunny but cool southerlies meant that drying times weren’t as good as in the lower South Island. In the south northwesterlies were developing, and in the east the foehn effect meant that the air was warm and dry, with a moderate breeze. Perfect drying conditions. Map of drying time for Thursday 12th October 2017. Note that this assumes full exposure to the sun and wind, and that lighter fabrics will dry faster. Another really useful application of this equation is a map suggesting which day would be best to hang out the washing. This is based on the assumption that washing is hung out around 7am and brought in by 7pm. A day is deemed a washing day if the drying time is less than 4 hours (to allow for the fact that most locations will be partially shady or sheltered from the wind), and for heavy fabrics such as towels. In this calculation some rainfall is allowed, as long as it is not in the last 3 hours and that the total evaporation exceeds any rainfall that might have fallen since 7am. Also this map is derived straight form model data, so always check metservice.com for the latest updates and forecasts which have been overseen by our expert meteorologists. Map showing suggested washing day for Thursday 12th October 2017. Where EVT is the hourly evaporation, Rn is the net radiation, G is the soil heat flux, es is the saturated vapour pressure of the air, and ea is the vapour pressure of the air at its current relative humidity. ρa is the mean air density at constant pressure, cp is the specific heat of the air, Δ represents the slope of the saturation vapour pressure temperature relationship, γ is the psychrometric constant, and rs and ra are the (bulk) surface and aerodynamic resistances. See  for units, derivation and more information. Maximise the exposure to the sun and wind. Consider where the sun will be during the day as well, as you want the clothes to be in full sun for as long as possible. A north facing aspect is best. Angle the line east-west so that the clothes don’t shade each other. Try to maximise the surface area exposed to the wind and sun – for example try to avoid folding towels over, which halves their surface area. Dark coloured clothes should dry faster than otherwise equal light clothes, so thick, heavy fabrics in light colours will dry the slowest, so give them the best spot on the line. Try to minimise the moisture in your clothes by giving them a good spin first. Hang clothes so the thickest parts are at the top (e.g. the top of a pair of jeans), so water doesn’t collect at the bottom. If you can open the zips and fastening you can increase the surface area, and also possibly channel the wind through the clothes better. Wind is helpful for drying clothes, but you don’t want so much your clothes fly away! As with all the other factors, check the latest forecast on www.metservice.com before you wash, and then all you need to worry about is what you’re going to spend that extra $130 a year on.